Our new series brings together all of our advice and tips about the importance of your creditworthiness and more when buying a home. Most buyers need to take out a mortgage, and that’s when your finances become an open book. Lenders will need to gauge if you’re worth the risk to lend you money. We’re here to help you learn some important strategies so you don’t miss out on becoming a homeowner. This week we will explain exactly what your credit score is all about. You will understand why every potential buyer needs to pay close attention to their score right now! There’s one number — your credit score — that could make or break your opportunity to become a homeowner. You need to take it seriously and stay on top of it well before you even think about buying a home. A great, and even good, credit score can save you money on your mortgage. We are talking about thousands of dollars! The better your score, the more willing lenders will want to work with you since you’re viewed as less risky. And that means they will offer you a lower interest rate and more loan options to choose from. So if you’re thinking of buying a home anytime soon, start today on getting your credit score on track. It’s never too late to begin practicing good credit habits. Make that a goal every single day. Remember that your credit score is just one part of your financial picture that a lender will use to determine your ability to pay back your mortgage. However, it’s a huge part of their review of your loan application. Don’t confuse your credit score with your credit report. Your credit score is like a grade given to your credit report. It’s a three-digit number that ranges from 300 to 850 that FICO provides after analyzing the data and information on your credit report. Lenders will get a credit score from each of the three major credit bureaus (Experian, Equifax, and TransUnion) based on the information (i.e., credit report) that they keep on file about you. Each score can be different. Most lenders use the FICO score for credit decisions even though there are other companies like VantageScore that pull data to provide credit scores. Remember that your credit score can even determine the interest rate you will pay for credit cards and car loans, not only mortgages. Your credit score helps lenders predict your potential credit success or failure with them. Your score tells lenders how you’ve handled your credit card payments and other loan payments, like your car or student loan. Keep in mind that your credit score is not based on your income, length of employment, or assets but on your creditworthiness. So a higher income doesn’t necessarily mean a higher credit score. It’s how you have managed credit. Your credit report, on the other hand, isn’t a “score” but a compilation of your financial history including all of your debts and payment history. Its information helps FICO and other companies calculate your credit score. Your report includes the type of accounts you have, the amounts, and the age of your accounts. However, as of July 1, 2017, new rules now allow the majority of civil debts and tax liens to be excluded from reports. Not knowing your credit score could lead to an unpleasant surprise when you apply for a loan. As your score gets lower, you’ll be offered higher interest rates and fewer loan options … not something you want to happen! That’s why you should start to monitor your credit score from all three bureaus about 3-6 months BEFORE you even start looking for a home. The earlier you start, the more time you can repair any credit issues if there are any. It’s easier now than ever to track your credit score. You can sign up online for myfico.com or other credit monitoring companies. You will get email or text alerts from myfico.com if there are any changes to your credit reports. It’s a great way to get an overview of your credit report and to find out which factors are affecting a low score. You’re also entitled to one free copy of your credit report from each of the three credit bureaus every 12 months. You can get it through AnnualCreditReport.com. Most experts say to stagger these reports so that you get one every 4 months. Your report includes all the credit activity that will be used to determine your credit score. Remember that each bureau’s report could have variations based on how they compile your information. Always check for errors on your report. An error could negatively affect your credit score, and ultimately, your mortgage rate. A good score is considered 720 or above, and that’s when lenders will offer you their best rates and products. A score of 680 is stilled considered good, but your interest rate will be considerably higher. When you start getting below 660, some lenders may deny your loan application completely or you’ll have access to only one or two loan options that may be available. Some FHA loans can be had for as low as 580 but most banks require a higher score. No matter your score, it’s good to use these strategies below. That way you can either improve it or keep it in a good or great range so you can qualify for a lower interest rate and better loan products. It takes work but if you make a plan and are consistent, your score will start to increase. Then you’ll be all set to meet with a lender! Don’t close credit cards that have a positive payment history. It’s good if you’ve had a credit card a long time since the length of your credit history totals around 15% of your score.Go back to our first article, Want a Home. Then Get a Credit Card, for a review. Pay your credit cards on time since your payment history accounts for 35% of your score. One late payment can affect your score for a year; many late payments for a few years. Make sure you set up a system of paying your bills that works for you. Don’t misplace bills or notices. Credit card companies usually wait to report your late payment to credit bureaus until about 30 days have passed the due date or once you’ve missed two due dates. If you miss a payment, call your credit card company immediately since they may agree to withhold reporting it if you have been a good customer so far. Pay more than the minimum on your cards to keep balances low. The higher your credit card balances the lower your score. Lenders care about how much you owe on your most recent statement. Make it a habit to keep expenses low and aim to pay back your balances in full if you can. Don’t max out your cards and use your entire line of credit! Keep balances below 10% or 20% of the total credit line so that your ratio of debt-to-available-credit is good. Remember that 30% of your credit score is determined by how much you owe on each account and how much of your credit limit has been used.Say yes if your account offers a higher amount of available credit, but don’t use it. Remember, higher available credit and lower balances means a better debt-to-available-credit ratio. Cut back on your credit card use for two or three months before your plan to apply for a loan or mortgage. This will help you get those balances lower and improve your debt-to-available-credit ratio. Keep it simple so you only have a very few number of cards to deal with on a regular basis. You want “older” cards in your wallet. How long you have owned your cards highlights the length of your payment history and influences the average account age on your credit report. The longer you’ve own it means you’re a dependable and stable borrower. Pay off your parking/speeding tickets and even library fines. You don’t want these “trivial” fines to be turned over to a collections agency. These little slip-ups could do damage to your score. Don’t seek out consumer credit counseling to improve your score since that information is put on your credit report. It may not lower your score but lenders don’t always look at counseling as a positive. They may see someone who has mismanaged their finances.However, you may want to look for counseling well before you think about buying a home, especially if you need help to get your finances and debt on the right track. Don’t ever feel like you can’t improve your score. Negative information on your credit report can be erased over time. It can take some work but your can improve your credit score once you start to implement these strategies. We recommend that our clients start to monitor their credit score and credit report as soon as they even think they want to be a homeowner. But first and foremost, start developing good credit habits today. Every potential buyer (and even homeowners who may want to refinance) must keep them up over the long haul. Next week, we’ll have our next installment, 3 Misconceptions that Needlessly Lower Credit Scores. 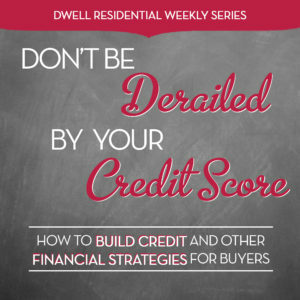 We hope you are enjoying our new series, How to Build Credit and Other Financial Strategies for Buyers. Amy was incredibly knowledgable about the local market, and helped walk us through every phase of the process: spending parameters, search, bidding, and closing. She was an excellent partner in the process, and I would highly recommend that anyone considering an agent take the time to contact her.